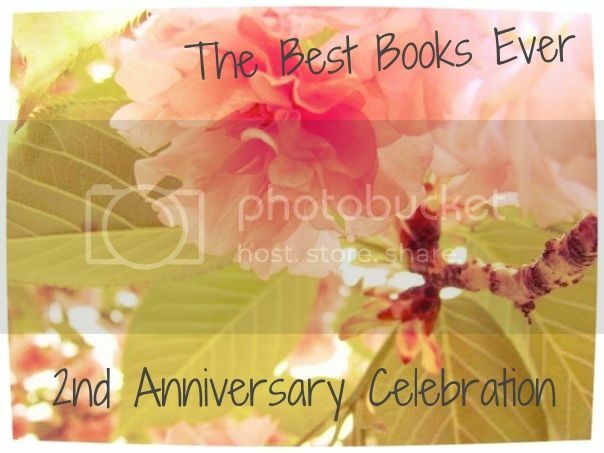 The Best Books Ever: 2nd Anniversary Celebration + Giveaways! 2nd Anniversary Celebration + Giveaways! I know what you are thinking.... The Best Books Ever? 2nd Anniversary? Huh? Who am I? Where am I? Well, I can't help you with those last two questions... but I can tell you that Short and Sweet Reviews... or was it One Minute Books... is now THE BEST BOOKS EVER! Why The Best Books Ever? That is obvious to our followers- we have a weekly feature entitled... Best Book Ever. It is such a fun feature that we wanted to highlight it on our new site. Gone is the confusion of what our site is called, gone is having two names for one site! Welcome to our 2nd Anniversary Celebration and site Relaunch! For the next week (or maybe more) we will be sharing thoughts about our past two years on the site, where we are heading, and a few of our favorite authors and books! We will also be sharing the love with our followers and we have tons of giveaways that you WON'T want to miss! So what are we talking about for our first day? Where we have been of course! As you know, I (Amanda) started this blog way back when. (2 years ago- duh!) I have been a member of Live Journal since 2002 (Sarah even longer! ), but I wanted to separate my reviews from my personal writings- and unless you are a member of livejournal, there really isn't a chance for community. (That has changed since the creation of Open ID). So here is a look back at all of our previous "looks". This is our fifth redesign of the site and our first professional design- we love it! So what is our first giveaway? You are going to LOVE this! So Elizabeth Fama- the author of Overboard and Monstrous Beauty and Plus One (Did I mention Monstrous Beauty?) is one of our favorite people in the YA world- and she is hooking one of our followers up with an absolutely unique and one of a kind copy of Monstrous Beauty. She is going to doodle and write all over her book- add her comments and drawings throughout her novel. So enter below to win a marked up, doodled on copy of Monstrous Beauty! Ahh! Congratulations! Also, I wanted to say thank you for showing screen shots of the layout transformations. I absolutely love when people do that to show all of the incarnations a blog has gone through. Congrats on the two years! That's awesome. I really like this design. It's my favorite out of all those you have had. Simple, but fun! Thank you- it is my favorite too! Three cheers for Two Years! YAY! I've really enjoyed checking things out and seeing the transformation to this point. I look forward to many more reviews to come. Congrats and oh my goodness, your redesign is too cute!